Two approaches to leading meetings - ThoughtForm, Inc.
An effective neutral facilitator isn’t a presenter who holds the floor and monologues on her own views and ideas. Incorporating visual thinking into a meeting can help make it run more smoothly. Still, even the most carefully planned meeting or most thoughtfully designed exercise will fall flat without a great meeting leader. Not every meeting needs a leader. But if a meeting is non-standard or happens infrequently, if its goal is to make a critical decision, or if it involves lots of participants, a clearly-defined leader is a must. Read more about the types of visual communication that inspires the ThoughtForm team. There are two main types of meeting leaders: the Neutral Facilitator and the Engaged Guide. Both leaders help teams. They each establish meeting goals, encourage participation, keep participants on track, and drive decision-making. What’s the difference between the Neutral Facilitator and the Engaged Guide? And when does it make sense to use each type of meeting leader? Read on. Who is the Neutral Facilitator? Let’s break this role down into its two components. The Neutral Facilitator is “neutral” in the sense that she’s an outsider. She could be trusted third party, or even just someone who’s not part of the immediate project team. She may have some knowledge about the topic or industry, such as jargon or trends, but she doesn’t have to. The important thing is that she doesn’t have all the answers, and she doesn’t contribute content to the discussion. As a “facilitator,” she helps the team achieve a particular task or result “by providing indirect or unobtrusive assistance, guidance, or supervision.” An effective neutral facilitator isn’t a presenter who holds the floor and monologues on her own views and ideas. Instead, she gives participants a framework and environment for productive dialogue by designing and leading exercises, keeping track of time, and ensuring all voices are heard. A good facilitator acts as a “lubricant” to enable clear communication and creative thinking and remove obstacles that hinder the group’s progress. Because she doesn’t have a stake in the outcome, the Neutral Facilitator is particularly well-suited to leading meetings that could be political, emotional, or otherwise tense. She can help to resolve conflicts between differing factions, ensuring that each side is heard. What’s most critical is that she remains impartial—that means no praising comments or taking sides. The Neutral Facilitator listens, asks clarifying questions, and keeps the group focused on achieving their shared goal. Who is the Engaged Guide? Let’s break down the role of the Engaged Guide, too. The Engaged Guide is “engaged” because he has a stake in the issue at hand. He’s an interested party, like a member of the team, or even the team’s leader. There is a particular purpose he’s trying to accomplish, such as getting input, driving discussion, or coming to consensus. Because he’s familiar with the issue at hand, the Engaged Guide brings valuable knowledge to the table and contributes to the content of the discussion. The “guide” part is where things get a bit fuzzier. One of the challenges the Engaged Guide faces is managing the group’s expectations and his responsibilities as leader and participant. In order to be effective, he needs to find the balance of weighing in on discussions while giving other participants a chance to talk. The Engaged Guide who’s not willing to be swayed or is only driving towards his own vision isn’t really an Engaged Guide at all. As an insider, the Engaged Guide is invested in making the meeting a success. His intimate knowledge is especially beneficial when a problem to be solved is complex and requires participants to challenge false assumptions. For groups that are comfortable with one another, having a familiar face at the helm can foster a deeper sense of collaboration and teamwork. If the Engaged Guide is able to intuit when to speak up and when to listen, he can help the group find a process that drives towards outcomes. So a meeting leader can be an outsider or an insider, impartial or invested, process- or content-focused. But does it have to be an “or”? Can you incorporate aspects of both the Neutral Facilitator role and the Engaged Guide role as a meeting leader? Sure. The key is making it very clear—to yourself and to the other meeting participants—which hat you’re wearing at any given time. That goes for both the planning and leading stages. Setting expectations for what your involvement will be helps to minimize confusion and keep things flowing. The McNellis Company suggests that if your role fluctuates within a meeting, changing your physical position in the room can help the group keep track. For example, when you’re at the whiteboard, you’re facilitating; when you’re off to the side or in the back, you’re participating. How do you choose which role to play in a meeting? Roger Schwarz explains, “The appropriate facilitative role is the one that accurately represents your relationship with the group.” So consider the other participants, and ask yourself, “How can I help the group be the most productive and successful?” Then get to it. 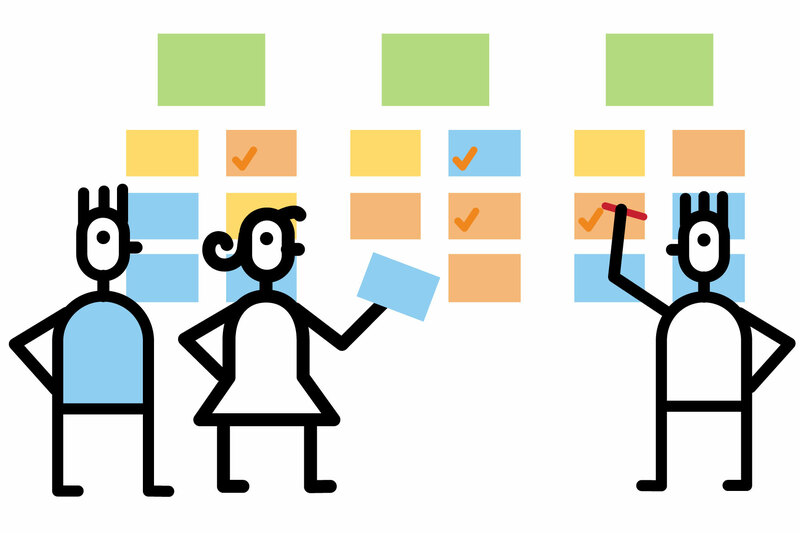 Run better meetings by using visual thinking. Download this illustrated white paper to learn how to make your meetings more productive, collaborative, and drive real results.